I always knew that the government in Canada (and its provincial and municipal subsidiaries) has historically been an old boy’s club. The term “alderman” just oozes older white rich oligarchic businessmen lounging in mahogany chairs with scotch and cigars, harrumphing about their financial exploits in transport, or manufacturing, or maybe textiles, or lawyering. When I first did a little digging into Toronto’s 19th and early 20th century election history, I had no idea what an alderman was. Alderman seems to be a word that basically means “elder man” or “wise man” (again: cigars, harrumphing, sideburns). Now originally, Toronto’s electorate of land-owning white men voted for 2 aldermen and 2 councilmen for each ward in the city. From there, those men would elect a mayor and a Board of Control within their number. 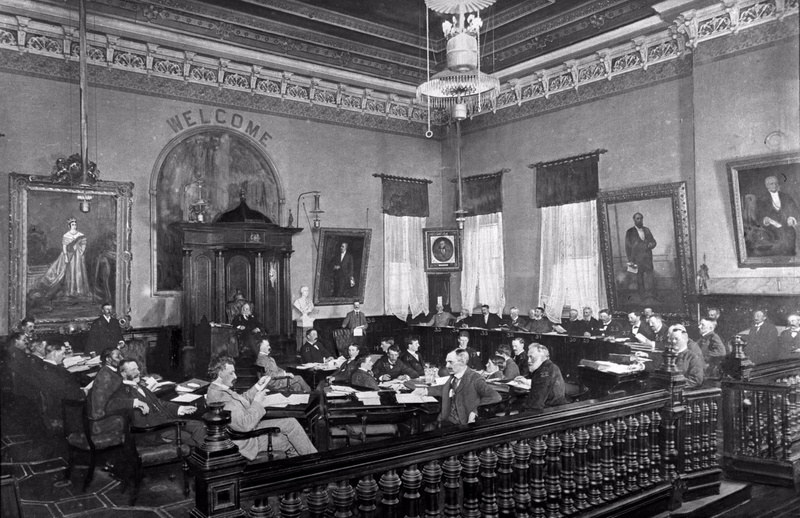 After confederation in 1867, there were no more councilmen elected, but rather 3 aldermen per ward. These elections went down on January 1st every single year. Now I realize that the 24 hour news cycles and constant online access means election news is crammed down our throat more in 2014 than it probably ever has been. I also realize that our city’s politics have been thrust into the international spotlight over the past couple years, so this past municipal election has felt particularly grueling, but imagine a municipal election every…single…year. And on New Years, no less! Women in Toronto (well, I should say single land-owning women) were able to vote in municipal elections starting in 1884. They got the right to vote in federal elections in 1918, and well-known and well-celebrated Ontario MPP Agnes Macphail became the first woman to be provincially elected in Canada in 1921. I want to backtrack one year and give a shoutout to one Constance E. Hamilton, who became the first female alderman elected to Toronto city council in the municipal election of 1920. I should mention that in most newspaper articles about her at the time she was referred to as “Mrs. L.A. Hamilton”, because she was married to Mr. Lachlan Alexander. In her local race of nine council hopefuls, she got voted into the third alderman spot for Ward 4 with 1,630 votes, beating out fourth place by a solid 243 votes. Unfortunately, apart from a “Who’s new in city council” image, most of the news coverage of Hamilton was relegated to the “Woman’s Daily Interest” section of the Toronto Daily Star. That being said, she was unflinchingly socially progressive and after being elected she was eager to pursue important civic issues, primarily ones that had to do with women, probably because she rightly felt there was no voice for them at city hall. Among other things, she was looking to advocate for “the appointment of more women in institutions that have to do with women.” Hamilton also said, “we need to see many more women, for instance, in Women’s Court, more women doctor’s to examine women, … as an associate judge in Juvenile Court.” (these are from an interview found on page 12 of the Toronto Daily Star on January 2, 1920). While I don’t like to use the word “crazy” when talking about history because everything is inevitably a product of its time, it’s truly crazy that these were novel ideas in 1920. C.E. Hamilton got re-elected the following year along with Ethel Small (mostly referred to as Mrs. Sidney Small), who cruised into Ward 4, missing 1st place voting by just 82 votes. Apparently the day after she got elected a woman tried giving Mrs. Small the ol’ rebuke by telling her “don’t you know that woman was made from the rib of a man and in all things from the beginning woman is after man? to which Ethel replied, “Oh yes, and we’ve been after them ever since. That’s why I’m in the city council.” Snap. After a couple of years as aldermen, both Small and Hamilton did not pursue re-election. So why is this worth delving into? Neither Hamilton or Small seemed to have affected great civic change or left a powerful legacy while on council (actually that’s not entirely true, both women went on to continue to champion important issues – maybe they just realized municipal government was already too swamped with gridlock or unnecessary bickering. There’s also this cool award given out yearly in Hamilton’s name), and while they were the vastly outnumbered minority on city council, they were still both part of the land owning white elite of Toronto. Sometimes history from a time like 1920, which is now nearly 100 years ago, can seem like a time and place entirely unrelated to us, where the people and issues are interesting to think about but that have no real connection to our lives in 2014. Toronto had a municipal election yesterday where two older white rich businessmen came 1st and 2nd in the mayoral race, and while we do have the most diverse city on the planet, our civic leaders aren’t representative of that. Make no mistake, Hamilton and Small (and of course their successors) were a crucial step in the long walk towards inclusivity and true diversity in Hogtown, but consider that it took until 1987 to get the name “alderman” changed to “councilor”. That’s also crazy. I hope Constance and Ethel took a couple alderman-like puffs of a cigar while they were on council, or at least did a bit of harrumphing.